Photovoltaic (PV) Solar Panels generate electricity by the Photovoltaic Effect. Discovered in 1839 by 19 year old Edmund Becquerel, the photovoltaic effect is the phenomenon that certain materials produce electic current when they are exposed to light. The light from the sun is made up of packets of energy called Photons. 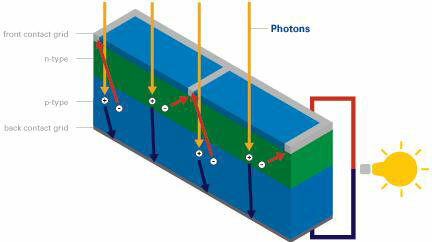 Each photon carries an amount of energy corresponding to its wavelength of light. When a visible light photon strikes a solar cell it can do one of three things: pass straight through, be reflected, or be absorbed. If the photon is absorbed, its energy is absorbed by an electron in an atom of the solar cell enabling it to escape from its normal position (photon excitation), cross the junction and fill a hole. Since electrons are physically moving across the PN junction, the positive charge carrying holes are effectively moving in the opposite direction around the load circuit (a rechargeable battery or light bulb etc). This completes the circuit providing more holes for the electrons to combine with and providing usable electricity. Energy from the sun can be extracted in this way using a standard solar cell at an efficiency of around 5-15%. This process can be repeated over and over again over the many decades of usable lifetime of solar cells. For traditional PV solar panels two halves of one pure silicon crystal are doped with two different dopants (e.g. arsenic, gallium, aluminium, phosphorus). One half of the crystal is left electron deficient – i.e. the atoms it contains are short of electrons. This is called the p-typelayer. The other half of the crystal has an excess of electrons – this is called the n-type layer. Since one half of the crystal has a lot of electrons, and the other half does not, there is an electric field across the junction between the two halves. Electrons in the crystal can only travel in one direction – from the electron rich half to the electron poor half. Where the two halves of the crystal meet is called a PN junction, and this doped crystal is asemiconductor. Pictured above is a representation of PN junction semiconductor. The half labelled p- has a shortage of electrons so contains acceptor atoms each with a hole which could be ‘filled’ by an electron. The half labelled n- has excess electrons and so contains donor atoms which have an extra electron.